Injuries definitely aren’t fun..But they are a part of playing sport and you have to take the good with the bad. After having a good run with injuries, I’ve twisted my knee and will be missing at least a few weeks. I think this will be the first time that I’ve missed playing games since 2009 when I got food poisoning on tour in Brazil with the Australian Boomers. Fair to say, I’ve been very lucky. A philosophy I was taught from an early age was “the harder you go in and attack the contest, the less likely you are to be the one who gets hurt”. This idea has definitely served me well over the years and I am lucky to have not had any serious injuries (knock on wood). The most important thing when being injured is (apart from your rehab!) your state of mind. It can obviously be very frustrating not being able to play and help your team win games. The thing I have to remind myself is that you have to “Control the controllables”. A great quote by legendary basketball coach John Wooden is, “do not let what you cannot do, interfere with what you CAN do” (thanks to @NateBotti17 for tweeting that one to me!). When I had a couple of spare tickets to the to give away I had people tweet me positive quotes to win them – I appreciated all of the tweets! You just have to find the positives. You can at least make a few positives out of any bad situation. Fully committing to your recovery and rehab is a given. I think a vital thing is to figure out and write down a couple of things you really want to focus on improving while you are missing time through injury. 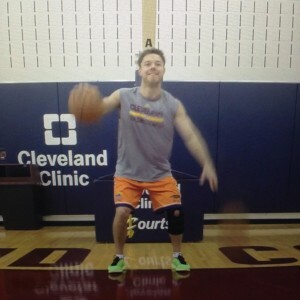 Physically, the two things I’ve focused on are my ball handling/ passing and form shooting. To work on the mental side of the game, I’ve watched my minutes from the games I’ve played in so far this season, looking for areas of improvement. Another thing is visualizing yourself in game situations (playing pick and rolls, defending, shooting), and playing the game in your mind. There is research that suggests that when you visualize doing something in your mind, it fires the same neural circuits as when you do them physically (the psychology degree comes in handy!). This visualization will hopefully help me pick up the speed of the game quickly when I I get back on the court.